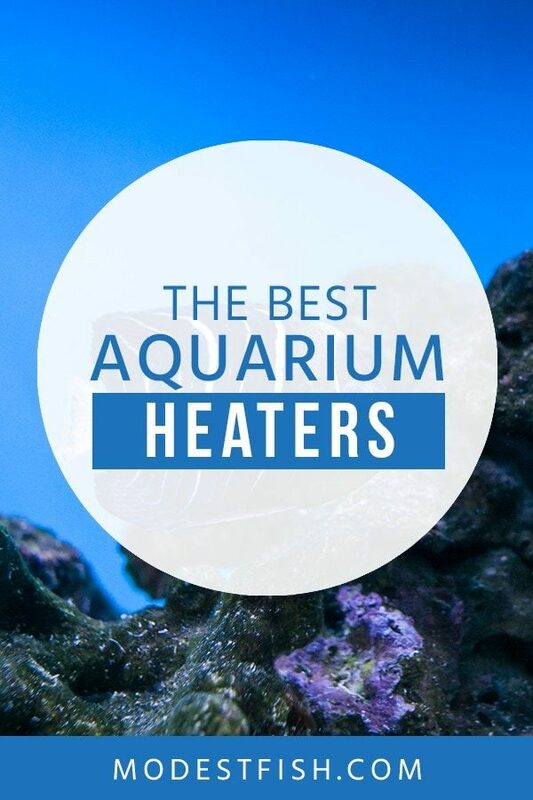 Choosing the right heater is so important for maintaining a healthy aquarium where your buddies can thrive. To do so, you’ll want one that maintains a stable temperature, is easy-to-read, and has safety features. 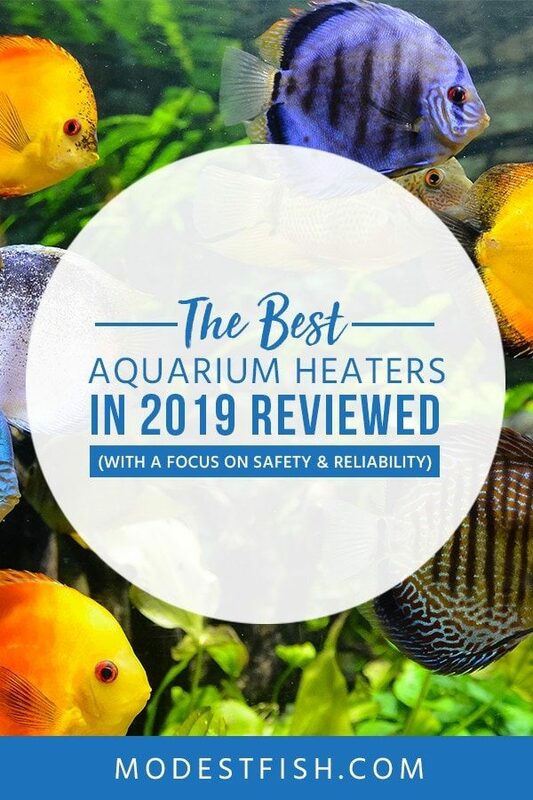 In this article, I’m going to guide you on what to look out for when choosing a safe and reliable heater, as well as review my top picks for aquarium heaters. This is a quick product comparison table to help you make a quick decision. What makes a heater ideal for your aquarium? In this part of the guide, I’ll show you the process I use to pick the right heater so you can make an informed decision. You’ll find five detailed reviews of my favorite heaters currently available. I share with you my overall favorite. **Before reviewing the individual heaters, I’d like to talk about how you can effectively choose the best one for your setup. If you’re just here to see detailed reviews, you can jump straight to it by clicking here. 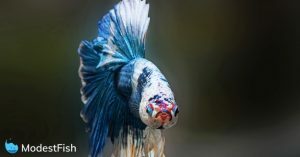 Let’s take a look at some important features you need consider when looking for the heater that’s right for your fish tank. The wattage is the power the heater. It determines the its ability to heat and maintain the desired temperature in your aquarium. As a general rule of thumb, you need 3-5 watts per gallon of water. I’d also recommend using two heaters, as opposed to one super-strong heater. You want to be able to adjust the temperature settings on your heater. Sounds silly, I know, but some heaters come with a set temperature. If you need to change the temperature for any reason, it becomes impossible. The best aquarium heaters will always have adjustable temperature gauges. Again, sounds obvious, but if you don’t make sure you’re able to easily adjust your heater underwater, it can be a very frustrating process. You want to look for heaters with a large control knob which is easy to grab and twist when submerged. In my opinion, the top aquarium heaters come with a numerical temperature gauges. You’ll want to make sure you’re easily able to view this number. Remember, this number may not always be accurate, it’s good practise to have a thermometer as well. Firstly, make sure the heater you’re buying is fully submergible, most of them are, but it’s best to make sure. Automatic shut off features are very good. These will automatically turn the heater off when the water level gets too low, or the temperature of your tank gets too high. A light indicator is the next safety feature I like to see. This means that the heater has a light when it’s on and when it actually heating. You’ll want to know if your heater is actually on or you’ll have to constantly monitor it. This fully submersible heater is available at 50, 100, 200, and 300 watts, making it ideal for a range of tank sizes. The Fluval E Electronic heater allows for precise temperature settings in 0.5 degrees increments between 68 and 93F. It’s built with a secure slim profile, that can be adjusted or removed without taking it off its bracket. A very good feature of the mounting bracket is it’s ability to mount the heater at various angles, so you can make it easy to view the front screen. Technologically advanced, it uses a microprocessor with dual sensors which provides constant real time water temperatures through is LCD display. The display uses a colored coded alert system to warn you if your aquariums water varies +/-2F from the pre-set temperature. The backlit readout makes it very easy to check your temperature when just walking by your tank. An integrated fish guard and glass sleeve protects your fish and invertebrates from coming into direct contact with the heater. This heater uses fast heat technology that’s built with a safety shut-off if the water levels get too low. And will warn you if the flow around it is too low. 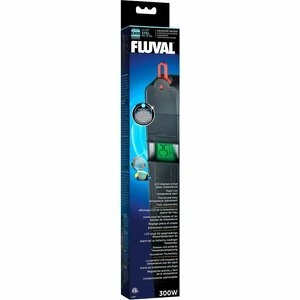 Summary: Featuring the latest advancements in safety and tech, the Fluval E Heater makes it very easy to maintain a safe stable environment. 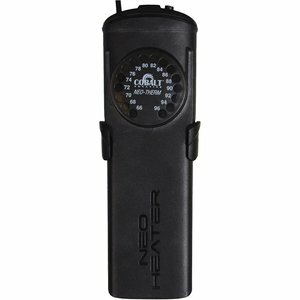 The Cobalt Aquatics Neo-Therm Heater is available in 25, 50, 75, 150, 200, and 300 watts. You’re able to set the temperature range between 66F and 96F and according to Cobalt, it will maintain your water temperature within 0.5F. The heater features a modern, super flat design that doesn’t take away from the beauty of your tank. The easy to set “one touch” control system is easy to access, and uses LEDs to display both your set temperature and the tanks current temperature simultaneously. Simply set your desired temperature and it will flash amber until it’s met. The heater is fully submersible and shatterproof, so there will be no worries about cracked glass. Plus, integrated thermal protection will shut down the heater safely before it can overheat, preventing disaster. Summary: Featuring a modern, super flat design, the Coblat Aquatics Neo-Therm Heater uses a simple ‘one-touch’ control system to set precise temperatures. 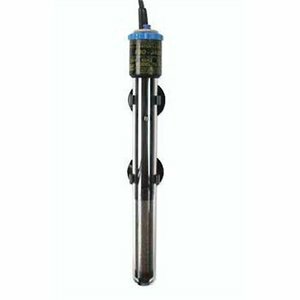 One of the most highly rated submersible heaters today, it’s available in 50, 100, 150, 200, and 250 watts. Made out of thermoplastic – making it shatterproof and practically indestructible. Being made of thermoplastic means it will disperse the heat its surface, so it’s not prone to burning fish that swim past. The large control knob located on the top end makes it very easy to access once it’s in your tank. You’re able to set the dial to be within +/- 1F; it deploys a clear monitoring light: red for heating and green to let you know that your aquarium has reached the set temperature. The electrical thermostat will automatically turn itself off if the heater is not in water, and will reset itself to resume working when placed back into the water. Summary: Almost indestructible, Aqueon’s Pro Heater features large controls for easy use, and automatic shut-off for added safety. Fully submersible, this heater is available in a range of watts and lengths. Due to it’s size, you may have to place this horizontally in your tank. The length can be a big bonus if you’re able to place this vertically, as the dial will be very close to the aquariums surface – making it easy set the thermostat without endless fiddling. The TruTemp dial uses a simple, straightforward setting function that allows you to set your desired temperature; keeping it with 0.5F. However, there is a calibration process which you will have to repeat a few days after the initial setup. The handy on/off indicator light makes it easy to monitor if the heater is working or not. Safety features include an automatic shut off in case the water level drops too low, and it’s made of shatter-proof and temperature shock resistant glass. You won’t have to worry about it breaking if there is a dramatic change in temperature. 25 watt: 9″L, 50 watt: 9″L, 75 watt: 10.2″L, 100 watt: 12.2″L, 125 watt: 12.2″L, 150 watt: 13.4″L, 200 watt: 15.7″L, 250 watt: 17.3″L, and 300 watt: 19.6″L. Summary: Simple to use, featuring a straightforward TruTemp dial. Due to it’s size, it’s definitely one to consider if you own a deep tank. Available at 100, 200, and 300 watts, this submersible heater is rather different from the previous on this list. The ViaAqua Titanium heater comes with its own remote temperature sensor. Which can be placed up to 18 inches away from the heater. Having a remote sensor away from the heater will provide you with a true temperature reading of your aquarium. This temperature is displayed within 1 degrees in glowing red digits on the control unit that sits outside of your tank (you can choose between Fahrenheit and Celsius). Having the control unit outside makes it very easy for you to read and adjust the temperature accordingly. This control unit must be kept outside of the tank. To set the temperature, you simply have to press the button until the temperature blinks, then again until your desired temperature is reached. A red LED light will then come on to tell you that it’s heating. The heating unit is made from titanium which is much more durable than glass, and will not crack. Ideal if you house larger fish. Easy for your fish to burn themselves on this heater. Would recommend getting a guard. Summary: Featuring a remote sensor, the ViaAqua heater provides a true temperature reading. If you’re looking for a high-end product, here’s one to consider. 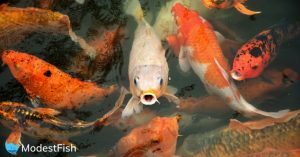 When it comes to aquarium heaters, the wellbeing of your fish should always comes first. That’s why my pick is the Fluval E Electronic Heater. 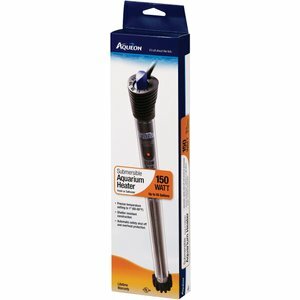 It comes in a wide range of watts, making it suitable for different sized aquariums. The controls are easy to access and adjust, and your life is made even easier with a clear color coded LCD temperature display. they’ll tell you if it’s too hot, cold, or if the flow’s not sufficient. The guard works perfectly at protecting the heater from a damage; especially from Cichlids and Turtles that love to tear these things up. And protects your fish against burning themselves. It incorporates a safety shut-off feature that will automatically shut off if the water level gets too low – preventing it from overheating. It ticks all the boxes, plus you get a 5 year warranty. I wouldn’t hesitate to purchase one of these heaters.